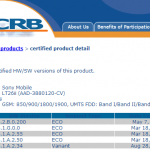 It’s great to see that Sony has not forgotten Xperia S, SL and P, as users have reported an OTA update coming for Xperia keyboard version 5.6.D.1.28. 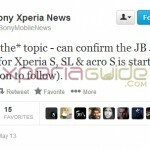 Xperia S, SL and P at present are on android 4.1.2 jelly bean and with the introduction of android 4.4 KitKat Project Svelte; Xperia S, SL, Acro S and P users can expect to get android 4.3 and android 4.4 KitKat updates though chances are very less. 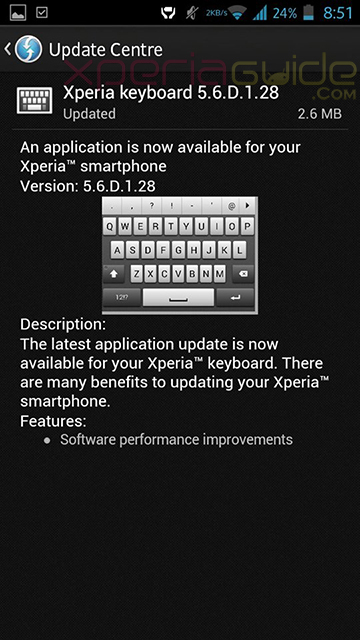 Xperia keyboard version 5.6.D.1.28 update is available in update center app on your Xperia S, SL and P. Update brings no visual changes rather some “software performance improvement” to rectify the lag in the keyboard app. 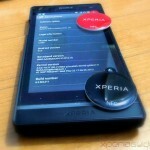 Look for the notification as shown below in update center app and update your Xperia Keyboard app. Tap on download button icon to start downloading the app. 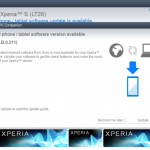 For all Xperia S, SL and P users who have not got Xperia keyboard version 5.6.D.1.28 update yet can download the below apk and install it like a normal apk, no root is needed. 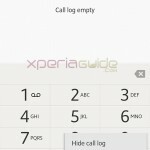 Let us know if you find any major change in Xperia keyboard version 5.6.D.1.28, drop your comments below. 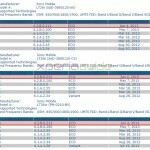 If the same update has rolled for any other handset, let us know in comments. 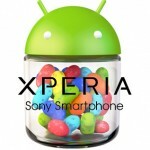 Not sure if this app works on other android 4.1.2 handsets of Xperia, try and let us know. 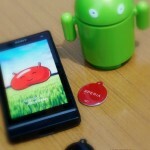 hey bro,i m owing a xperia p on android 4.1.2,and having many bugs issues lyk album goes blank ….!!!!! and must imp ,it disconnect from pc ,so when i have to transfer some data ,it’s shows your phone has stopped or disconnected. and i have tried many times to reinstalling whole os through pc companion ,than cell works normally ,but after some time the problem starts again. 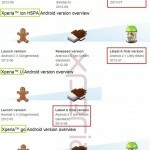 and will x.p will gt any further update lyk 4.3 o 4.4 android…. hoping for a reply from u …. thanx for your effort …. It’s software issue…only a future update can solve it. 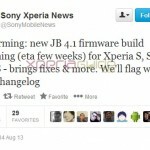 You can hop for 4.4 in 2nd batch but i din’t think it will get and S3 not supported anymore. hello I need the keyboard is as alphanumeric which is like 12 keys, such as having the number 2 corresponds to the abc letter, I would like to have that is 12 keys comes onto the xperia choosing mascara keyboard but not me I get out alone which is qwerty and love the other, but I was unable to install the apk I get application not installed there any way I can have it through apk, and not use root mode. my android version is 4.4 please i need help is that it is uncomfortable for me to use the qwerty keyboard type yy apology is not well understood is that my translations speak Spanish and I am using a translator.